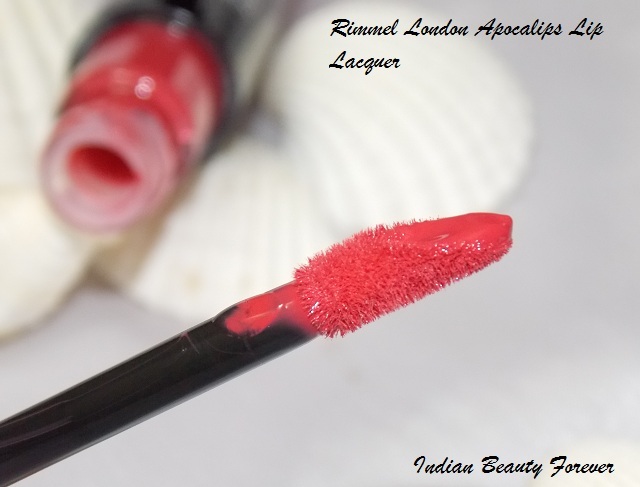 Every since Rimmel London products hit Indian market that too at reasonable prices, their stuff seems to sell like hot cakes. Online they are available on Slassy.com. I still remember, I tried placing an order for Rimmel Stay matte compact but it was always sold out, when finally I could get hold of that. The same thing happened with these lip lacquers. At last, I got the one I wanted. 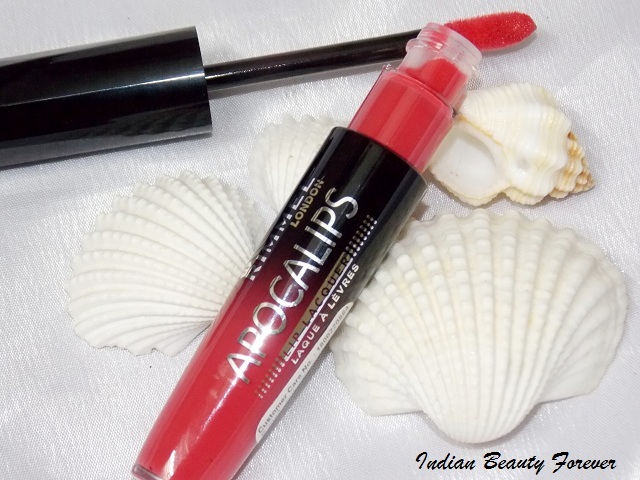 I will review Rimmel London Apocalips lip lacquer in Aurora today in this post! 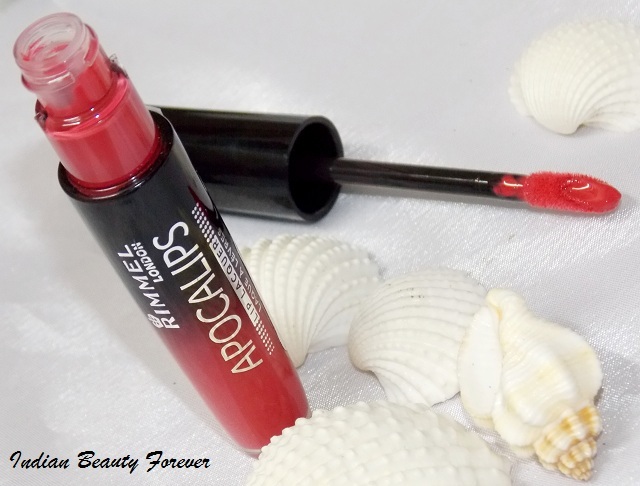 Experience: Rimmel London Apocalips comes in this charming tube pack with a wand which makes it easier to use. Top of the cap is beautifully made. In short, packaging is pretty good! Inside that, it has an applicator and the slanted tip wand which is very soft and scoops out adequate product at a time. Aurora is a fascinating warm pink corally tinted color that is simply beautiful. It is a universal color, keeping that in mind, it’s going to look attractive on almost all the skin types. It has this perfect warmth and hues of coolness that can work in favor of most of us. This can instantly make your face look more lively and bright. This color can definitely give you an option when you are not into reds and bright, in your face kind of shades. 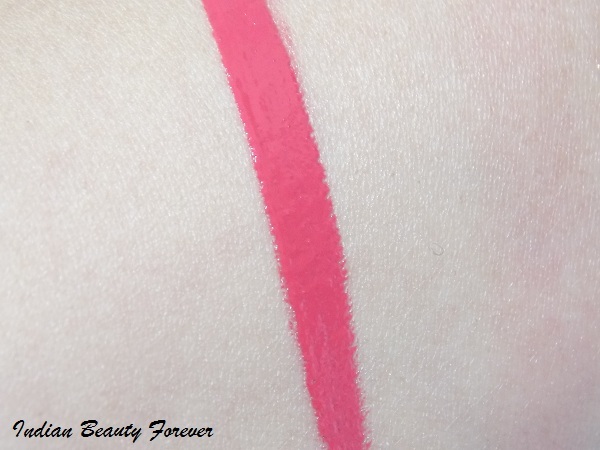 Pigmentation is good, and has a liquid lipstick like consistency. I apply two swipes and the color that it shows is true to the shade that is being shown in the tube. In the arm swatches pictures, if will see I have swiped it just once. So, I am pretty impressed with its pigmentation. 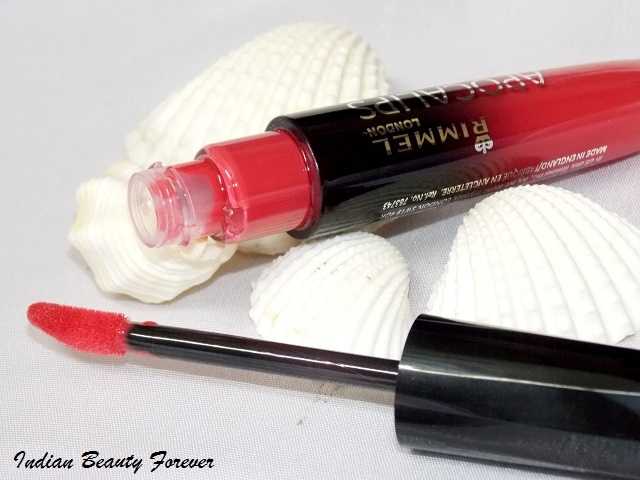 Now there is something which I really LOVE about this Rimmel lip lacquer. Since color and pigmentation even though it is impressive but there is something that makes it more captivating for me, that is its fragrance. It smells so amazing and exactly like mulberries. I still remember, How much I used to love eating those from the tree that we had in front of the house we used to live earlier in. Tempting it smells! 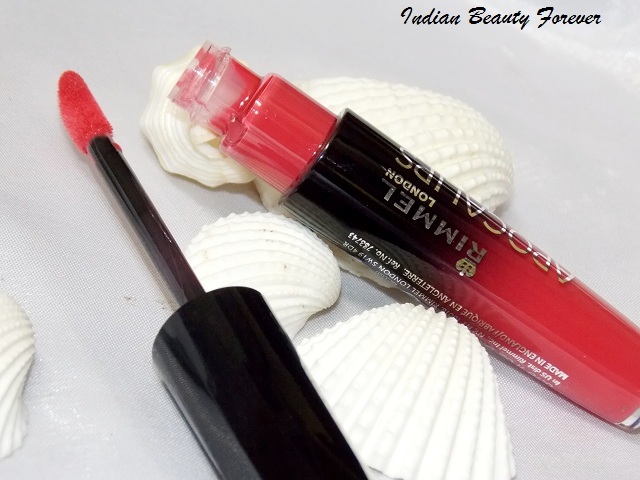 Its texture is buttery soft and gives a glossy finish to the lips. With this on, now I can easily skip my lip balms as it hydrates, moreover, its formula is quite moisturizing. Therefore, it can eliminate the use of lip balms before using this. 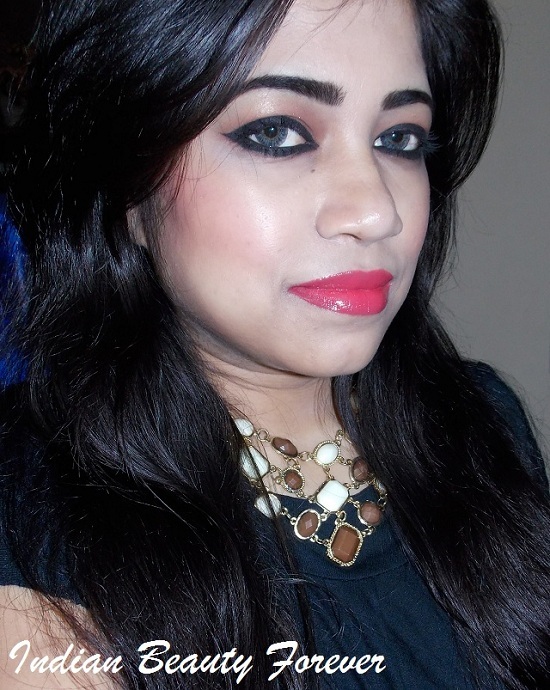 I have used Rimmel London lip lacquer couple of times and every time I apply this, I love the color even more. It stays on my lips for 2 hours after which it starts to fade while you talk, lick or eat but that should be fine as such products have somewhat similar staying power. 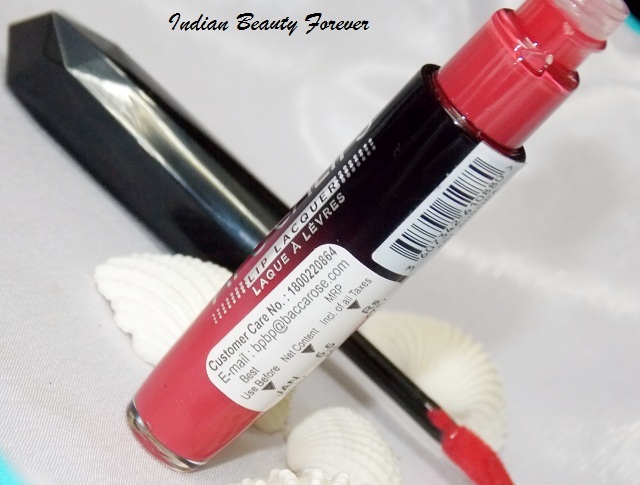 As a result of its creamy glossy formula, it may bleed at times, though that it very slight. 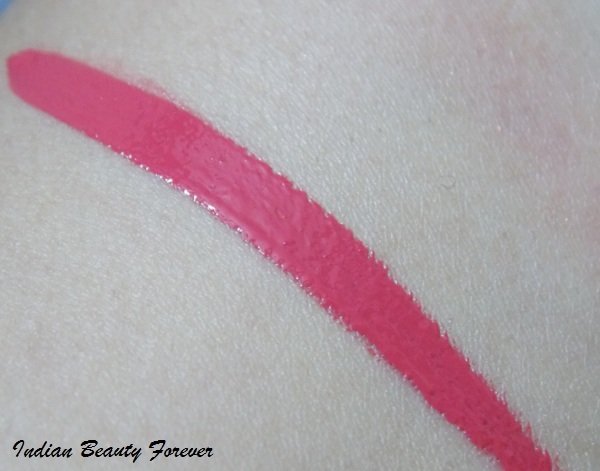 To avoid that you may use a lip liner before applying this to keep the lip color in place. 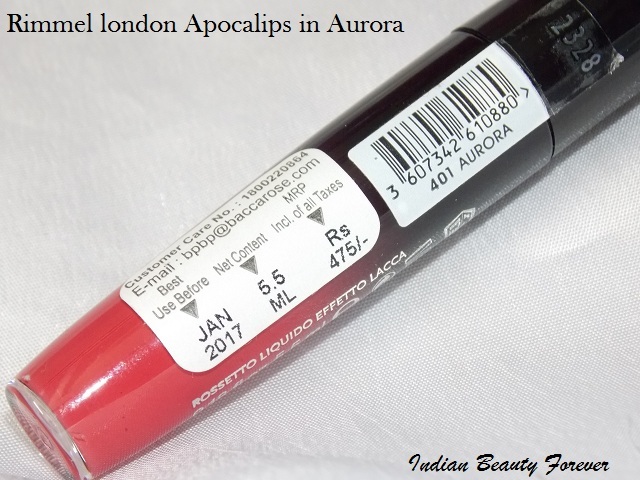 Take: Rimmel London Apocalips Lip Lacquer in Aurora is a universal shade that is going to suit most skin tones. Its warmth and brightness can make your face look lively without washing out. 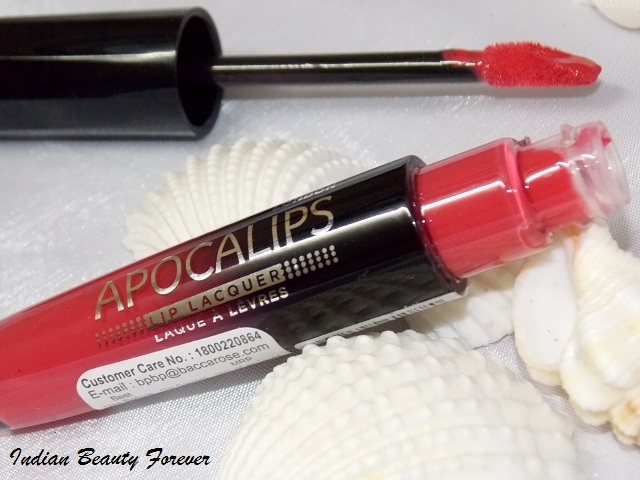 Pigmentation, packaging and texture of this lip lacquer makes it worth the money even though staying power is for 2-3 hours only but nonetheless there would be a faint rosy tint left behind. 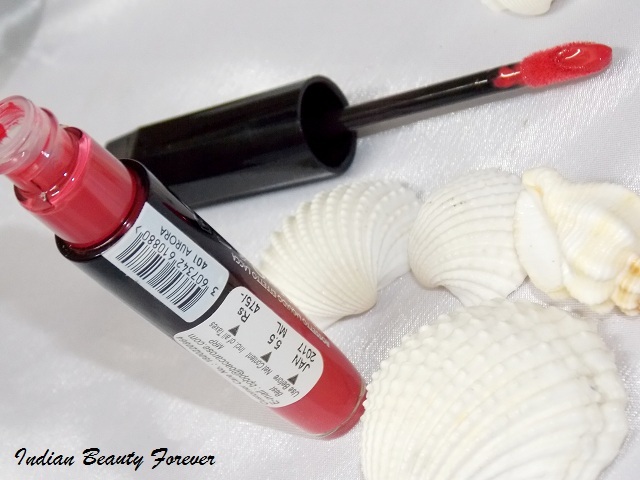 At the price and the beautiful shades that they have to offer, I will recommend you to check out this range.